The company's HAMR technology uses a small laser diode attached to each recording head to heat a tiny spot on the disk. Seagate claims it has built and tested the world’s first formatted and fully functioning 16TB enterprise hard drive platform in a standard 3.5-inch form factor – the highest capacity hard drives ever produced. The platform uses the company’s heat-assisted magnetic recording (HAMR) technology. Seagate says it developed this to enable the next big increase in the amount of data that can be stored on a hard drive. According to the firm, HAMR uses a new kind of media magnetic technology on each disk that allows data bits, or ‘grains’, to become smaller and more densely packed than ever, while remaining magnetically stable. A small laser diode attached to each recording head heats a tiny spot on the disk. This is said to enable the recording head to flip the magnetic polarity of each very stable bit, allowing data to be written. Seagate says by delivering HAMR technology in the industry’s standard form factor, it will reduce total cost of ownership by getting a lot more terabytes into the same space as a conventional hard drive. The company is using a 16TB pre-release version of its HAMR-based Exos drive to run the tests customers commonly use when integrating hard drives into enterprise applications. It says the successful tests have confirmed the HAMR drives are plug-and-play and operate just as any other hard drive in standard enterprise application environments. Jason Feist, Seagate’s senior director of enterprise product line management, says: “Our testing has demonstrated the drives’ compatibility for enterprise systems that are being used today. 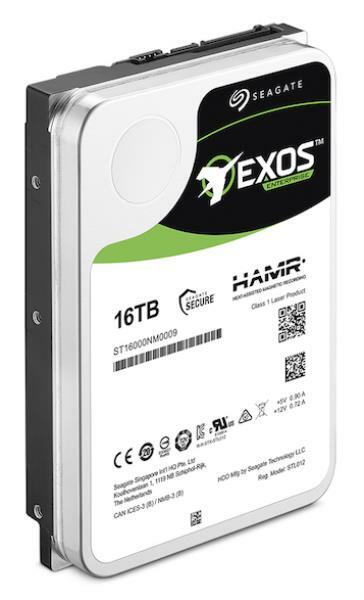 A 16TB pre-release version of a HAMR-based Exos drive is being used to run application tests. These latest tests for HAMR technology follow on from Seagate’s in-lab reliability evaluations last year. In those tests, the company says HAMR read/write heads “far exceeded” industry standards for reliability and lifetime data transfer capability. It claims they surpassed customer requirements and standard hard drive specifications by a factor of 20. “The HAMR technology we demo’ed last year is now being fully integrated into Seagate’s high-capacity enterprise product portfolio,” says Feist. Seagate adds that it plans to grow beyond 20TB per drive in 2020.